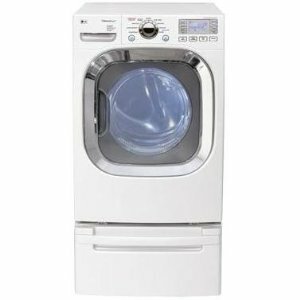 Cleanliness, fresh scent and wrinkle-free clothes are what the primarily white LG DLGX3002W dryer model offers. The dryerís trademark True Steam Technology and other features or options make these promises possible. The LG DLGX3002W even comes with a cycle that can freshen up clothes that are non-washable or have been washed quite a long time ago. True Steam technology plays a primary role in the LG DLGX3002Wís effectiveness. Usually, a buyer chooses this particular dryer model because of its use of true steam. With true steam, the dryer can get rid of both odors and wrinkles. If the EasyIron option is selected, the time that will be used to iron the garments will be further reduced. This option moistens the garments so that any iron can just glide on them. The SteamFresh cycle can freshen up clothes that have been stored for a long time already. In 20 minutes time, the userís garments of up to 5 pieces at a time will be ready to wear. The cycle can also get rid of wrinkles already. The user may choose to work with the EasyIron option at the same time. The user can choose the Steam Sanitary option for non-washable clothes. This option will help get rid of most invisible germs and bacteria. Users will no longer have to wonder how to clean decorative pillows. The Steam Sanitary option is a hygienic but fabric-safe feature. The LG DLGX3002W is equipped with 9 drying programs and 10 options, which is pretty typical with some of the dryers from the LG SteamDryer series. The designer color for this particular model is traditional white. However, the buyer can also find this same model in wild cherry and pure silver. The color options will appeal to varying tastes. The LG DLGX3002W comes with an optional matching drying rack and pedestal. The doorís center is made of transparent glass with silver-edged chrome rim. The door is reversible to provide the user with an option in terms of the direction it will be opened to. Such a feature will prove to be valuable in tight spaces. The control panel has an easy to understand and read LCD display. It makes the product easy to use. There are status signals that alert the user as to what stage the cycle is in already. Backed up with a one year limited warranty on parts and labor, the LG DLGX3002W should be able to give its owner some reassurance for at least a year. The materials used for building the product are durable enough to make it last for much longer than the protected period. The LoDecibel feature enables the product to operate at its best without emitting disturbing noise. The stackable feature easily allows the LG DLGX3002W model to be placed in a small laundry area with its matching washer. Its use of gas may render it banned in some apartments.